On August 15, 2012, Duke Slater was released by McFarland & Company. Duke Slater is the first full-length biography of legendary African-American pioneer Fred “Duke” Slater. 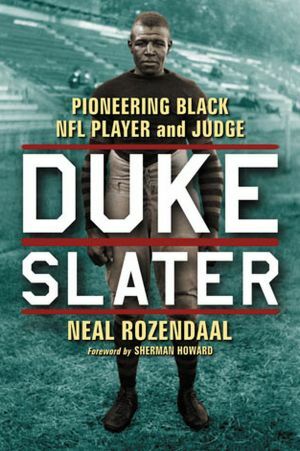 Duke Slater was the greatest African-American football player of the first half of the twentieth century. He earned seven letters at Iowa in football and track and was one of the key members of Iowa’s undefeated 1921 Big Ten championship team. Slater made several all-time All-American teams after his retirement – in other words, multiple organizations selected him as one of the top two or three dozen athletes to ever play the game of football. He was a pioneer for African-Americans in college football, the NFL, and in the legal field. On top of everything else, critics far and wide praised Slater for his intelligence and humility. Duke Slater is a man who should be remembered as one of the true icons of sports in America. Sherman Howard provided the foreword for the book. Howard was a long-time friend of Slater’s. Duke Slater convinced him to attend the University of Iowa out of high school, and though Howard transferred after just one season, his affection for Slater remained. Sherman Howard later played five seasons in the NFL, and after retirement, he returned to Chicago. He continued his close friendship with Duke Slater for the rest of Slater’s life and served as a pallbearer at his funeral. Sherman Howard’s foreword in the book is absolutely tremendous, and I can’t thank him enough for taking the time to speak with me. This is a very, very important book to me. I’m not just telling Duke’s story; there are projects underway to finally give Duke Slater, at long last, the respect and recognition he deserves. I have launched a sister website to this one that will champion Duke Slater’s memory. That site, DukeSlater.com, has much more information about the Duke! If a major Slater story breaks, I’m sure it will show up in both places, but I don’t intend to do much crossreferencing between the two sites. So you might want to check out that site from time to time to see what projects are being undertaken on Slater’s behalf! I’m pleased to announce that you can now order your copy of Duke Slater right here! The price is $35, which as always includes free shipping. I’d be glad to autograph/personalize your copy if you would like…just put your request in the notes section when you check out on Paypal!